I have never done anything like this before. Ever since I started The Economic Collapse Blog in late 2009, I have never issued any kind of “red alert” for any specific period of time. As an attorney, I was trained to be level-headed and to only come to conclusions that were warranted by the evidence. So this is not something that I am doing lightly. Based on information that I have received, things that I have been told, and thousands of hours of research that have gone into the publication of more than 1,300 articles about our ongoing economic collapse, I have come to the conclusion that a major financial collapse is imminent. Therefore, I am issuing a RED ALERT for the last six months of 2015. This time around, I wish that I could visit the living rooms of all of my readers and explain to them why we are on the verge of another major financial crisis. Unfortunately, that is not possible, but hopefully this article will suffice. Please share it with your friends, your family and anyone else that you want to warn about what is coming. Let’s start with a little discussion about the U.S. economy. Most of the time, when I use the term “economic collapse” what most people are actually thinking of is a “financial collapse”. 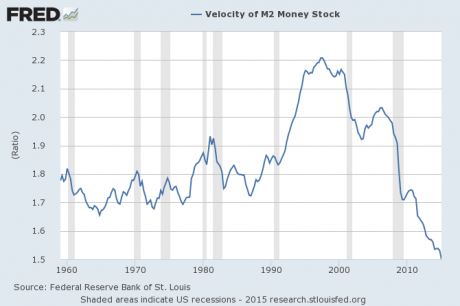 And we will talk about the imminent “financial collapse” later on in this article. But just because stocks have recently been hitting all-time record highs does not mean that the overall economy has been doing well. This is a theme that I have hammered on over and over again. It is my contention that we are in the midst of a long-term economic collapse that has been happening for many years, that is happening as you read this article, and that will greatly accelerate over the coming months. This is the kind of chart that you would expect from a very sick economy. And without a doubt, our economy is sick. Even the official government numbers paint a picture of an economy that is deeply troubled. Corporate profits have declined for two quarters in a row, U.S. exports plunged by 7.6 percent during the first quarter of 2015, U.S. GDP contracted by 0.7 percent during the first quarter, and factory orders have declined year over year for six months in a row. If the stock market was connected to reality, it would be going down. But instead, it has just kept going up. As I discussed yesterday, this is a classic case of an irrational financial bubble. 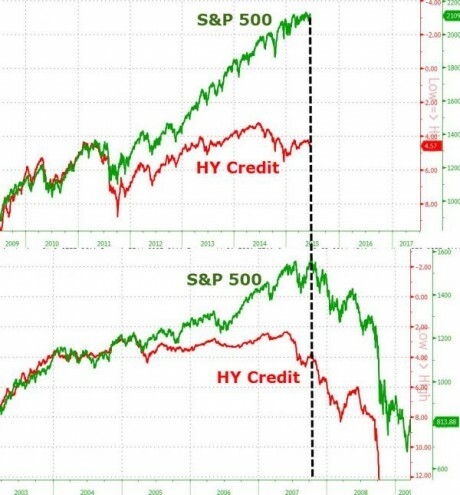 If I was writing an economic textbook and I wanted to include an example of what a run up to a major financial crash looks like, it would be hard to come up with anything more ideal than what we have watched unfold over the last six months. Just about every pattern that has popped up prior to previous stock markets crashes is happening again, and this is something that I have written about so much that many of my readers are sick of it. And without a doubt, our financial markets are primed for a crash. Only two times before has the S&P 500 been up by more than 200 percent over a six year time frame. The first was in 1929, and the stock market subsequently crashed. The second was in 2000, right before the dotcom bubble burst. And by just about any measure that you can possibly imagine, stocks are massively overvalued right now. 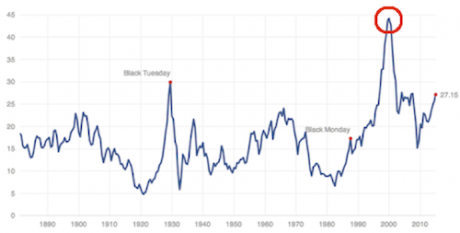 I think that compared with history, US stocks are overvalued. One way to assess this is by looking at the CAPE (cyclically adjusted P/E) ratio that I created with John Campbell, now at Harvard, 25 years ago. The ratio is defined as the real stock price (using the S&P Composite Stock Price Index deflated by the CPI) divided by the ten-year average of real earnings per share. 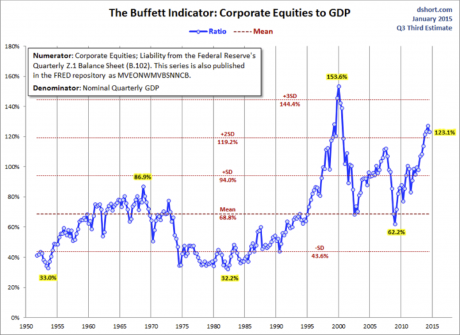 We have found this ratio to be a good predictor of subsequent stock market returns, especially over the long run. The CAPE ratio has recently been around 27, which is quite high by US historical standards. The only other times it has been that high or higher were in 1929, 2000, and 2007—all moments before market crashes. But the CAPE ratio is not the only metric I watch. In my book Irrational Exuberance (3rd Ed., Princeton 2015) I discuss several metrics that help judge what’s going on in the market. These include my stock market confidence indices. One of the indicators in that series is based on a single question that I have asked individual and institutional investors over the years along the lines of, “Do you think the stock market is overvalued, undervalued, or about right?” Lately, what I call “valuation confidence” captured by this question has been on a downward trend, and for individual investors recently reached its lowest point since the stock market peak in 2000. But it isn’t just stocks that are going to crash during the next financial crisis. Bonds are going to crash as well, but what I am concerned about most of all are derivatives. Derivatives are going to play a starring role in the next major financial crisis. I cannot emphasize this enough. In fact, if you want to listen for just one word on the news that will let you know that things have started to really unravel, just listen for the word “derivatives”. This form of legalized gambling is going to crush “too big to fail” banks all over the planet during the next major financial downturn. The “too big to fail” banks in the U.S. alone have 278 trillion dollars of total exposure to derivatives, but they only have 9.8 trillion dollars in total assets. To say that they are being “reckless” is a massive understatement. For much more on the coming derivatives crisis, please see my previous article entitled “Warren Buffett: Derivatives Are Still Weapons Of Mass Destruction And ‘Are Likely To Cause Big Trouble’“. Ron Paul has just released a new video in which he warned all of us to “prepare for a bear market in bonds“. Carl Icahn says that financial markets are “extremely overheated—especially high-yield bonds“. Max Keiser recently told Alex Jones that a great financial collapse is coming. Martin Armstrong says that his Economic Confidence Model predicts that the “Big Bang” is coming in “2015.75“. Jeff Berwick of the Dollar Vigilante says that “we’re getting very, very close to the next crisis collapse” and he has specifically pointed to the month of September. James Howard Kunstler has predicted that stocks are going to “crater in Q3 as faith in paper and pixels erodes“. Lindsey Williams recently sent out an email alert in which he warned that his elite friend has told him that “they have a World Wide Financial Collapse scheduled between September and the end of December 2015“. Gerald Celente has warned about “the Great Panic of 2015“. Bill Fleckenstein has said that 2015 could be the year of the “big accident“. Ray Gano has stated that we will see a financial collapse “probably starting in the third quarter of 2015″. Legendary investor Jim Rogers recently said that he believes that “we will see some kind of major, major problems in the world financial markets” within the next year or two. Alex Jones recently released a video in which he explained that he recently received “two different calls” from “extremely prominent wealthy people” warning him about what is coming by the end of this year and asking him why he isn’t leaving the United States “before October”. When I read what Rosenberg wrote, it struck me that it was precisely how I have been feeling too. In my entire life, I have never had such an ominous feeling about any period of time as I have about the last six months of 2015. Like Rosenberg, I feel a “tremendous sense of urgency”, and I feel a great need to warn as many people as I can. In addition to everything above, quite a number of economic cycle theories that were developed by secular economists all point to big trouble for America between the years of 2015 and 2020. For more on this, please see my previous article entitled “If Economic Cycle Theorists Are Correct, 2015 To 2020 Will Be Pure Hell For The United States“. Earlier today, I publicly announced that I was issuing a RED ALERT for the last six months of 2015 on the Alex Jones radio show. You can watch video of that interview right here. In this article (which is about three times as long as one of my normal articles) I have only shared a small fraction of the information that has led me to issue this red alert. But if you want to know more, and you are not afraid to really go down the rabbit hole, I would encourage you to check out a full two hour presentation that I did down in Dallas, Texas on the nightmarish years that are coming. The period of relative stability that we have been enjoying is ending. What comes next is going to lead us into the worst period of time in modern American history. I wish that I was wrong about this. But the goal is not to scare you. My wife and I live our lives with absolutely no fear, and that is my desire for all of my readers. There is hope in understanding what is happening and there is hope in getting prepared. Personally, my wife and I believe that the greatest chapters of our lives are ahead of us, and I hope that you have a similar outlook. We need a generation of people that are willing to rise up and do great things even in the midst of all the chaos and darkness that is coming. It is when times are the darkest that the greatest heroes are needed.